I guarantee that you'll love these canvas sretching pliers, and they are guaranteed to last your whole lifetime." I've been stretching canvas for more than fifty years; it is not an easy job to do well. When I started stretching I used just my fingers, and when I started stretching a lot, I found canvas pliers to be a big help; but I would break up to six pairs a week. I found some types that were too hard to use, other's that just didn't work at all, many that hurt to use them, I taped my hands and wore padded gloves. Finally, I started to design my own pliers. Over the years many customers and conservators gave their insights and helped with final design implementation. Now I've got the pliers to tackle any stretching job. And, by far, they are the most practical and well made canvas pliers available. 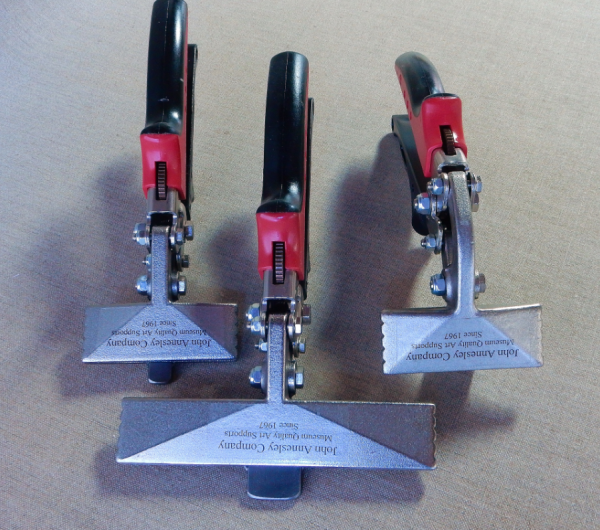 All three of our canvas plier designs now fit in your hand even better. Our new comfortable handle grips are ergonomically-designed with a soft rubber top where the force of your hand engages. Plus a slightly longer handle gives you more leverage and more room to comfortably position your hand. The fulcrum is what really gives you the power, the lever action helps you really pull tight. You can maintain even tension with much more ease. When you release pressure, our pliers still spring open the machine-textured jaws. The jaws are also angled toward the front edge, leaving a gap at the back of the jaws for excess fabric. Plus some people have requested a locking mechanism, now all three models have one available. Golden Artist Colors has a monthly online newsletter titled Just Paint. In it there is a James Bernstein article titled "A Remarkable Way to Stretch Canvases" that strongly recommends our canvas pliers (near the bottom of the article). James Bernstein is a nationally recognized Art Conservator. We also have a number of videos about how to stretch canvas using the method Mr. Bernstein describes. This is how we stretch all our art fabrics, as well as our customer's paintings and giclees.